Chili can be a controversial subject. If you go to a chili cook-off, you’ll see more styles than you can believe. And they’re all unique! Green chili from Denver has little in common with Texas chili, which tastes nothing like the cinnamon-laced chili of Cincinnati. The first time my mom made chili for my dad, he was quite disappointed. Her chili had pasta in it and not much seasoning, just like everyone’s chili in her southern Indiana home. Chili is also an endlessly versatile meal. Are you vegetarian? Leave out the meat! Have some leftover grilled meat you want to use? Chop it up and throw it in! Eating healthier? Lean protein and extra veggies for the win! You can throw it in the slow cooker to have dinner ready after you get home from work, or break out the pressure cooker to have it ready right away. It’s truly one of my favorite meals. Our chili recipe focuses on lean protein, extra veggies, and a spice profile that the whole family can enjoy. I call it Confetti Chili because all the veggies look so cheerful. My kids are not very tolerant of heat, so I go for warmer spices and let diners add red pepper flakes or hot sauce to their own bowls. You could totally use this recipe with your own spice preferences. 8) Top with your favorite accompaniments and enjoy! You can use any protein you like for this recipe. I’ve made it with turkey, beef, leftover shredded chicken, and vegetarian crumbles. The flavor changes a tiny bit, but it’s all delicious. I made this in my Instant Pot on the slow cook setting (I used sauté to brown the meat and then simmer the zucchini at the end). It’s what my schedule required that day, but I also make it on the stovetop when I’m hanging around the house in the afternoon. My only hesitation on recommending it for a slow cooker is the zucchini. If it gets overcooked, it’s just mush. If you need to use a traditional slow cooker, you might want to steam the zucchini separately and stir it in at the end. One recipe makes A LOT of chili! This was two full dinners for my family of five, plus lunch serving for mommy and her workout buddy. Sometimes I freeze the leftovers to have an easy weeknight meal. 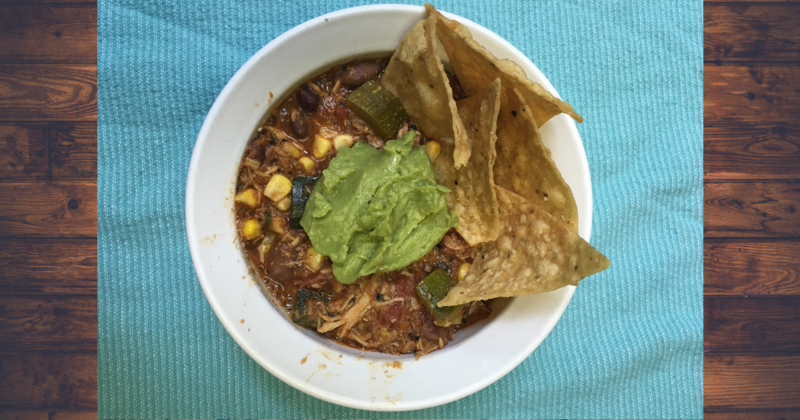 Enjoy a bowl of chili as we head into fall! Join us next month for a shortcut version of a Mediterranean classic.